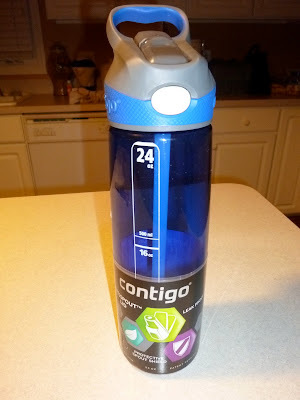 I was given the opportunity to review one of Contigo's 24 oz. water bottles. 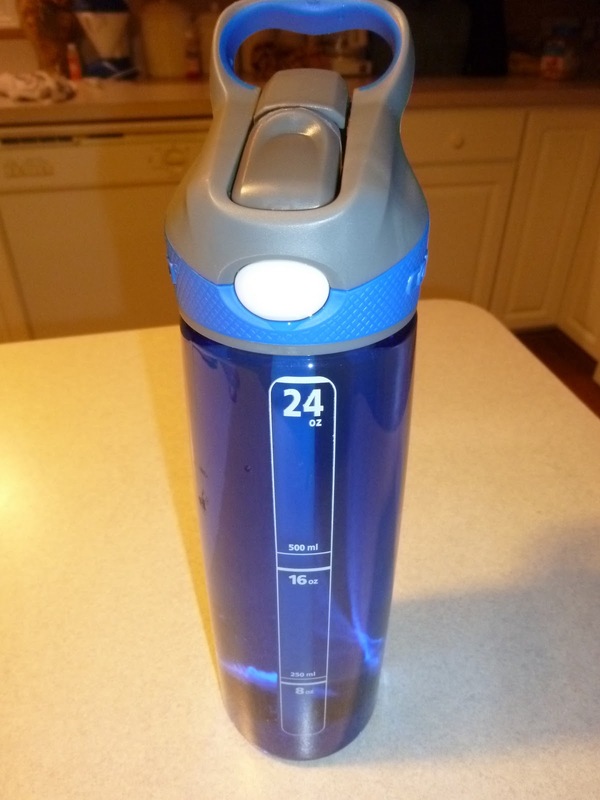 This is the Contigo 24 oz. Madison Water Bottle with Autospout. They sent me a blue one(which I like) but you can also order these in purple, and even a 2-pack(blue and orange). I was really happy to do a review of this because I have been looking for a good quality water bottle that I could use before/after exercise and running. This fits the bill perfectly! It has a patented AUTOSPOUT - a press to release button that opens the drinking spout. It is leak proof and spill proof when closed. I threw this thing all over the place to check. This thing just does not leak. The bottle is made out of Tritan - this gives it high impact resistance, won't stain or retain odors. Carabiner clip on the handle makes this easy to carry. You can clip it on a bag for ease. It has a large opening to fit ice cubes - going to be using that for sure! It also has a scale on the side to show how much you have drank from it. So here are a few pictures. As you can see, there are markings on the side to help you know what you have left. A little closer look of the cap reveals the Carabiner clip on the top that you can attach this to a backpack, bag, etc. There is also a little white button on the front that you press and the top pops open. Inside pops up a softer plastic(silicone) so it's very comfortable to drink from. Also, if you notice from the picture above, when you are done, you push down where the grey part is(you can kind of see, it's shaped like your finger) and the top goes back in. I really like that design because this means you don't have to touch any part that is going in your mouth to help keep it clean. You sip it just like a straw. As you can see, the top of the bottle is plenty wide to fit ice cubes and/or pour any mix into it that you want. 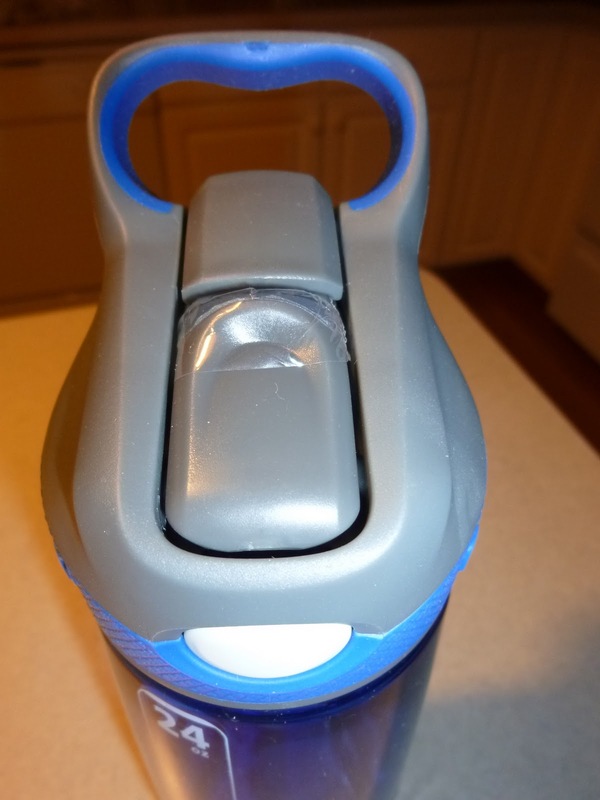 It also comes with a removable straw that attaches to the top that goes clear to the bottom of the bottle. It's nice that it's removable to allow you to clean it better. And this is it, the final product filled and ready for when you need water or your favorite drink. I've already used it twice including once after my run today. It works great! Quality - Made with high quality material. The product just feels(and is) really well made. Great design - they thought of everything - straw to the bottom, button to keep lid clean, button so you don't have to touch what goes in your mouth, markings for amounts, a clip for easy carrying. Price - very fair at only $12.99 at their website. I would have thought at least $25 given the quality. Many competitor bottles of this quality are $20-25 range so this is really a great deal. 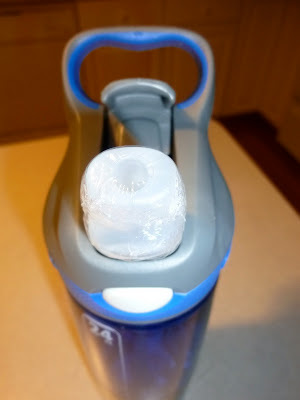 Not insulated - although Contego does make other types of bottles including insulated models. Environment - great for the environment. Will save us from putting water bottles in the garbage. I can say one thing is for sure, this bottle is going to get used all the time. I plan to use this every time I run and also every time I go to a race. It's one thing I know that will get used on a daily basis. Contigo was also kind enough to offer one of their fine water bottles as a giveaway for a blog contest. Stay tuned as I'm putting together a holiday gift guide for runners shortly and will include the giveaway in that post. * Please note that I received this as a complementary water bottle in exchange for a product review. I was not required to give a positive review. wow, that is a nice water bottle! 9.99 is a steal, every water bottle I've ever purchased has been at least 15, more like 20-25. Thankyou!! Christmas list idea to send to my husband!! Thanks for the review - that bottle looks like something I'd like if I wasn't in a monogamous relationship with my Camelbak Better Bottle. Love that you don't have to touch the straw part. Huge germophobe here.